I am going to start running a campaign soon, within the next week or two. I plan to run sessions both in person and online within the same setting and sharing the same fictional timeline. All player characters from both in-person and online games will likely belong to the same adventuring company. For rules, I will be using the current beta version of my Hexagram ruleset. It should be recognizable to anyone that has played in one of my games before as it incorporates the most recent unreleased version of the Hazard System as the engine. The player character advancement system is slightly more freeform than traditional D&D but should be easily approachable. Advancement has been significantly streamlined even compared to previous playtest versions of Hexagram and the Final Castle. Experience points will be gained from building relationships with factions or personages rather than recovering treasure. 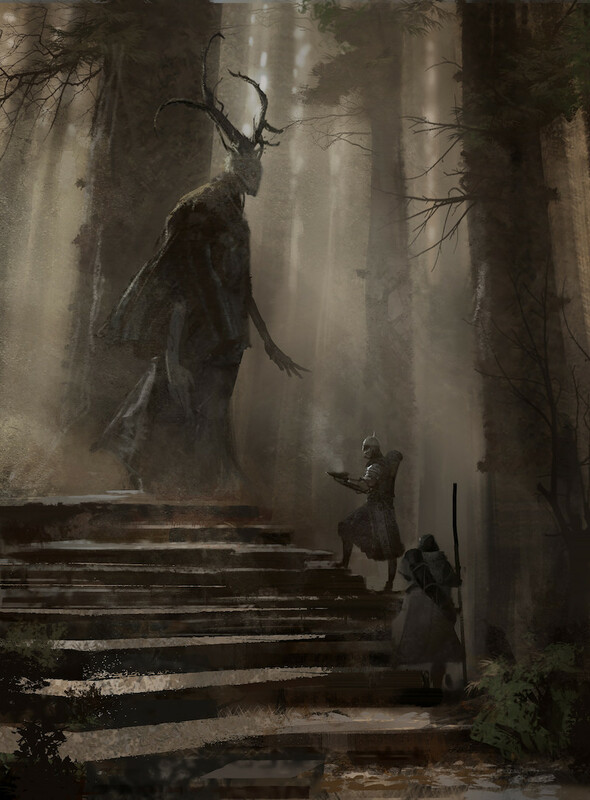 I will be using the setting from the Swedish RPG Symbaroum as my starting point, though I will be dialing up the elements that remind me of Slaine and dialing down the elements that seem like Tolkien through a Swedish lens. In particular, the witches and barbarians of Symbaroum remind me of the Drunes and their people. I will be reimagining the nature of the Dark Lords and the civilized religion of the sun god Prios to make them less black and white. I chose Symbaroum primarily because I like the art but also because the setting provides a set of factions and personages that should ease my prep work. I may also incorporate some elements from Gavin‘s excellent Wormskin zine, though my vision of Symbaroum and the great forest Davokar is far less fey than Dolmenwood. Session structure will follow the excursion format, meaning consistent player attendance will neither be necessary nor expected. I have a core of regular players that I will give precedence to regarding session seats but based on my experience there will also often be openings for others. I will post about specific scheduling and availability on Google Plus. This will NOT, however, be a Flailsnails-friendly campaign. Over the summer, I plan to run 8-10 sessions after which I will assess the rules for any needed modifications and the campaign for continued interest. I considered running the Adversary’s Dungeon scenario I posted about recently but decided that I did not want to run a tentpole mega-dungeon campaign this time. There will, however, still be plenty of dungeon exploration. Further, I think the Adversary’s Dungeon concept would require a significant amount of upfront effort in preparation to run the way I would prefer and one of my main goals for this campaign is to minimize my initial prep overhead. More details about the setting and rules forthcoming. This entry was posted in Campaigns and tagged Symbaroum on July 8, 2016 by Necropraxis.